Fighting out of Albuquerque, New Mexico, United States, Michelle “The Karate Hottie” Waterson, 32, won in her most recent bout in the Ultimate Fighting Championship. It was hier fourth victory in the promotion. Featuring 12 mixed martial arts matches, the UFC held “UFC 229” at the T-Mobile Arena in Paradise, Nevada, United States on October 6, 2018. In the eighth bout of the evening, Waterson competed in the women’s strawweight division against Felice “Lil Bulldog” Herrig, 34, Crystal Lake, Illinois, United States. After three five-minute rounds, the women’s strawweight bout between Waterson and Herrig was left in the hands of the judges. In the end, referee Jason Herzog raised the hand of the fighter from New Mexico as the winner via unanimous decision. “UFC 229” marked Waterson’s sixth UFC bout. The first three opponents she defeated were Angela Magana, Paige VanZant and Cortney Casey-Sanchez. By defeating Herrig at “UFC 229,” Waterson improved his professional mixed martial arts record to 16 wins and 6 losses. On the other hand, Turner’s record downgraded to 14 wins and 8 losses. 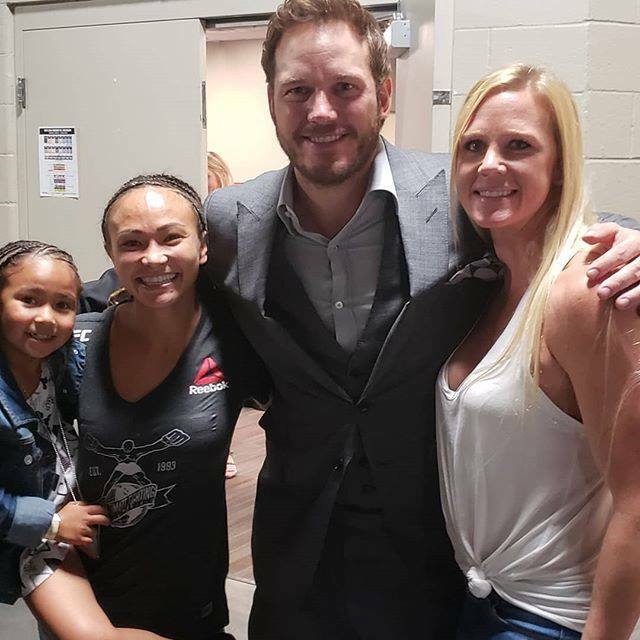 At “UFC 229,” Waterson met with her fellow UFC fighter Holly “The Preacher’s Daughter” Holm, 36, who is also from Albuquerque, and “Avengers: Infinity War” star Chris Pratt, 39. Waterson was also with her daughter Araya Waterson.